Daylilies are the backbone of the perennial garden flowerbed. They are tough, low-maintenance, adaptable plants that thrive almost everywhere. These flowers bloom best in full sun and when they are divided to encourage growth. Also, dividing them is a great way to build your garden with minimum cost. Here’s how to get more blooms for the buck. 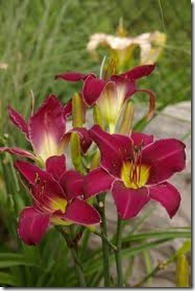 Place a garden fork about six to 12 inches away from the center of the daylily clump. Push down gently and then pull the clump out of the soil. Daylily clumps may just pop out, but work around the entire plant with the fork until the plant has been released. Inspect clump and roots for any disease or insect damage. Place daylily clump on the ground. Insert two garden forks into the clump perpendicular to the ground and gently pull them apart, forming two clumps. Repeat process until desired number of plants has been reached. Cut divided foliage down to six to eight inches. Prepare the bed or hole for the new daylilies. Dig a shallow hole. They do not need much depth to grow well. Place the new plant in the hole and fill with original soil. Carefully pat down the soil. Water the new plant deeply and cover with two to three inches of mulch or other organic material to help retain moisture. Home gardeners on a budget should consider buying just one- or two-gallon containers of their favorite daylily. They can be divided right from the pot for instant bonus plants. 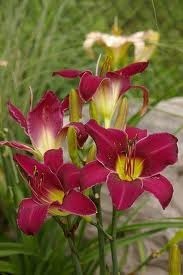 Daylilies can be divided anytime during the growing season, but the best time is after they have finished blooming in late summer. This gives the new plants plenty of time to establish roots before frost. A shovel can also be used to cut stubborn daylily clumps apart. Place a clump on the ground, insert the shovel in the center and push down. Often you can just use your hands to divide small plants.